We are pleased to announce that our client Structural Composites Inc.’s Founder and President Scott Lewit is a finalist for the Founder’s Forum Founder of the Year Award. Lewit was featured in the latest edition of Space Coast Living Magazine, along with three other finalists. The ceremony will take place on August 28th at the 2018 Founder of the Year Event at the Crowne Plaza Oceanfront in Melbourne. Structural Composites provides a wide variety of engineering services in every segment of the composites industry. They provide high quality materials that are used in the marine industry, aerospace sector, and the military. Their Co-Cure technology includes breakthrough coating and structural resin that has expanded within the engineering industry; and at a low cost too. Structural Composites’ Co-Cure gel provides toughness and flexibility that can better withstand shock and impact and is more resistant to damage. Since its beginning, Structural Composites has expanded into further markets for engineering including transportation, wind energy, and infrastructure. 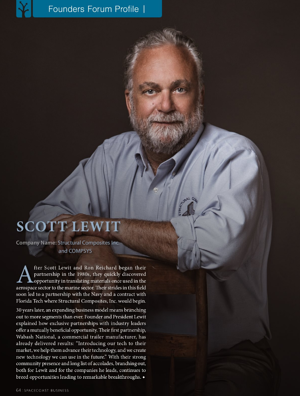 We celebrate our client Structural Composites Inc. and founder/President Scott Lewit! Way to go! For more information, please visit: http://www.structuralcomposites.com/.